Yngwie Malmsteen Releases "Concerto Suite for Electric Guitar and Orchestra"
Concerto Suite for Electric Guitar and Orchestra (also known as Concerto Suite for Electric Guitar and Orchestra In E Flat minor Op. 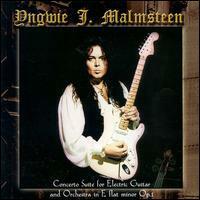 1) is an album released in 1998 by Yngwie J. Malmsteen on Spitfire Records. It was his first attempt at a classical concerto suite featuring electric guitar solos. Malmsteen composed all of the music though his compositions were scored by his friend and fellow musician David Rosenthal. The music is conducted by Yoel Levi, and performed by the Czech Philharmonic. Malmsteen has been keen to emphasize that unlike other collaborations between rock musicians and classical orchestras (eg Metallica's performances with the San Francisco Symphony or Deep Purple's Concerto for Group and Orchestra), which feature a rock group playing with orchestral accompaniment, this is orchestral music which happens to have an electric guitar as its solo instrument. Malmsteen later admitted that in many of the pieces he had to dub in his guitar solos to make them "fit". However, the entire piece has since been performed live in Japan with the New Japan Philharmonic and is available as a DVD release.